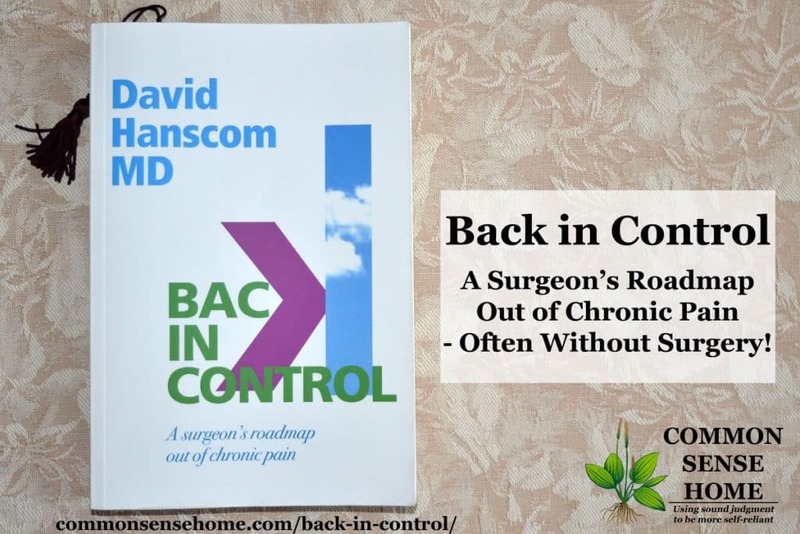 I read “Back in Control – A Surgeon's Roadmap Out of Chronic Pain” because chronic pain is a challenge for many of my readers. I've also personally dealt with a skin condition that made even simple things like breathing and smiling painful. Chronic pain affects your entire life. I didn't understand until I lived through it. Now I want to help others find relief, too. As we age, most of us don't bounce back as easily from injuries. That said, what cripples one person can barely slow down another. What's the difference? Dr. David Hanscom, a complex-deformity spinal surgeon of over 30 years, found that far too often he couldn't heal patients with surgery unless they addressed other areas of their lives. In the course of healing his own chronic pain, Dr. Hanscom developed a system that has helped hundreds of patients live pain free. What's the best part? You can tackle many of the steps to healing on your own – without surgery. 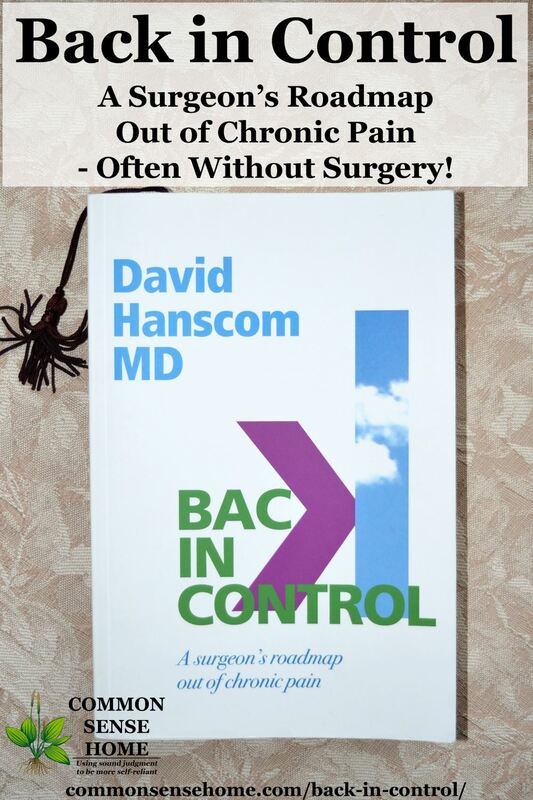 Back in Control gives you the tools you need to start asking the right questions about your chronic pain so you can regain a pain-free or low pain life. Your first thought about a book written by a surgeon might be that he would first suggest surgery. If you caught Dr. Hanscom early in his practice, you would be right. Early on, he looked to surgery as the first step in healing. That has changed. Like most of us, the good doctor found that experience often contradicts what we “know to be true”. Time and again, he saw patients with surgeries that went perfectly who still didn't recover as they should. Alternatively, he saw patients who would potentially be recommended for surgery based on their test results (spine deformations, etc.) who reported no pain or debility. The turning point for Dr. Hanscom was when he finally dealt with his own chronic pain. For 15 years he struggled with chronic and sometimes debilitating pain, but no more. The pain pathways are still there, but now he has tools to bring his pain back in control when it flares up. He's brought those same tools to his practice, and to his book. Dr. Hanscom summarizes the protocol he now requires for patients undergoing elective surgery. This protocol is followed for 8-12 weeks – no overnight cures promised. That said, many patients start to see improvement in the early stages of the treatment. Quite frequently surgery is avoided. The information is in depth and detailed. Much of the work focuses on the mind/body connection. Chronic pain is often in our head, but it's not false. One of the most surprising things I learned from the book was that our brains process chronic pain and acute pain (trauma) differently. Also, once our chronic pain pathways are activated for an extended time, we become more sensitive to all types of pain. As mentioned above, those pathways can't be eliminated, so we need to learn how to calm these pathways down and keep them dormant. Another interesting note from the book is that pain support groups often make pain worse, not better. When you focus on the pain and talk about nothing but the pain and how it affects your life, you reinforce the pathways that cause the pain. Bad juju. Joining a group with a shared productive hobby is much better for your mental and physical health. If you're one of the millions afflicted with chronic pain, this book and the protocols in it may change your life for the better. For under $20 for a new paperback copy (kindle $9.99), it's worth a try. I received a copy of this book from Chelsea Green Publishing for review. As always, my opinions are my own. Originally posted in 2017, updated in 2018.